Ben Nevis in Scotland is the UK’s highest mountain at 1,345 m/ 4,411 ft high. Not quite as high as the mighty Mt Everest in Nepal at 8,848 m/ 29,029 ft. But still pretty high. So does that mean you need a guide to do the Ben Nevis walk? No, definitely not. 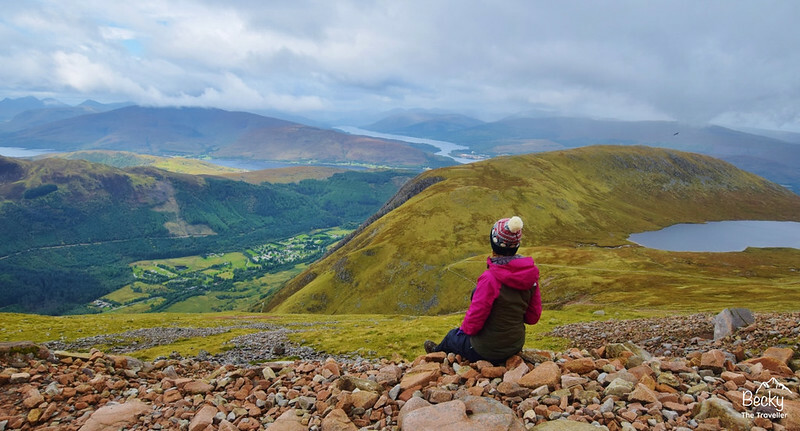 But hiking independently with friends or even solo means you need to know a few things about the route, walk time and kit before walking up the mighty Ben Nevis. Last autumn, I was travelling around the UK hiking in all 15 of our beautiful National Parks. Ben Nevis was a mountain I’d always wanted to climb. (And yes I know it’s not officially in one of the National Parks). But I decided to include Ben Nevis climb on my trip anyway. 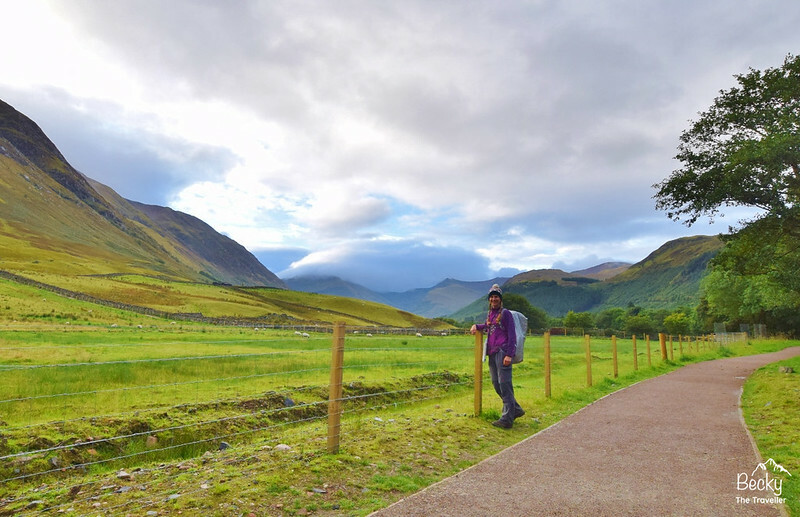 In between visiting the Cairngorms and Loch Lomond and the Trossachs National Parks, I stopped off at Fort William to finally climb Ben Nevis. Are you wondering whether anyone can climb Ben Nevis? Here I share my solo hiking adventure up and down Ben Nevis. 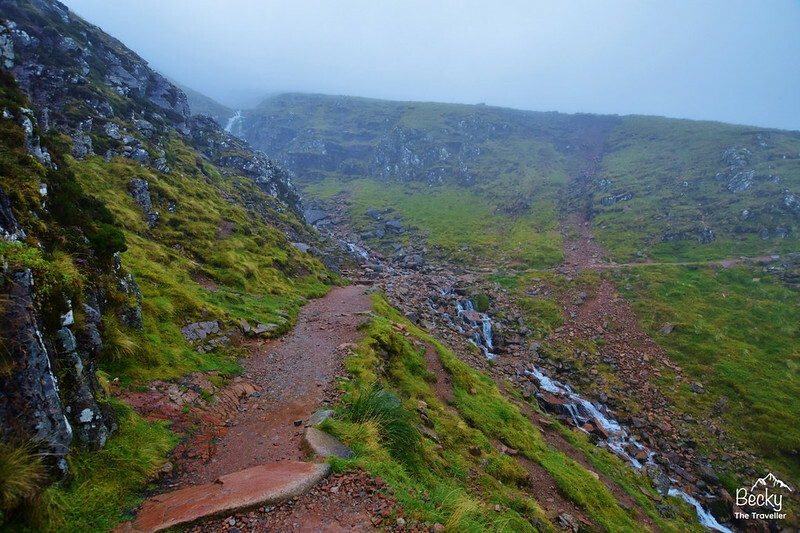 Including how long it takes to climb Ben Nevis, what to wear for the hike, what training you need to do for Ben Nevis, which route I took to the summit and some top tips for completing the Ben Nevis walk. 1.1 What route did I choose to climb Ben Nevis? 2.1 What to wear for hiking Ben Nevis? 2.2 What other gear and Equipment do you need? 2.3 When is the best time to climb Ben Nevis? 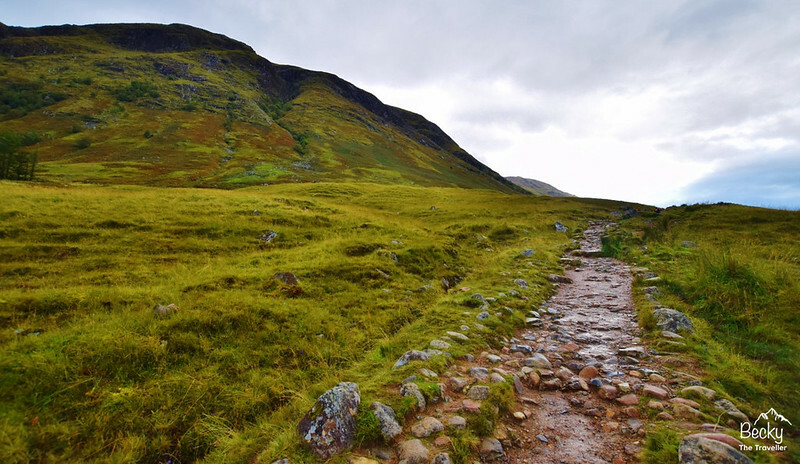 2.4 What training do you need to do to climb Ben Nevis? 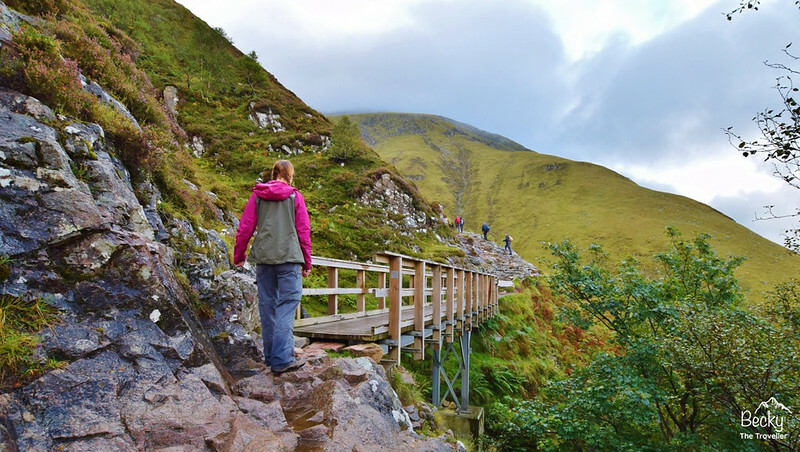 3 Where to stay if you are hiking Ben Nevis? What route did I choose to climb Ben Nevis? There are a few options for reaching the summit of Ben Nevis. The most popular route for your average hiker (and by that I mean someone like me with no rope climbing skills) is the Mountain Path. Also known as the Tourist Track, that name says it all! If you want to climb Ben Nevis via a different more challenging route, you will need technical experience and equipment, including helmets, harnesses and ropes. The other option is to book an experienced guide to climb the mountain. I love trying different and less touristy options when I’m travelling and hiking. But this time I settled for the recommended Mountain Path. Why might you ask? Firstly, I wanted to make it to the summit and as this is the easiest walking option so I had a better chance. Secondly, my map reading skills aren’t amazing and I didn’t want to get lost or have to involve search & rescue teams. How embarrassing would that have been haha! And thirdly, I’m a solo hiker so this route means more people to chat to along the way! Plus if I had any issues with option two then there were people around to ask for help! My planning began before I left home, borrowing my brother’s Ordnance Survey OS Explorer 392 map. I then arrived at Fort William the day before my planned walk and set up camp at Glen Nevis Campsite, literally a 10-minute walk from the start of the Ben Nevis hike. 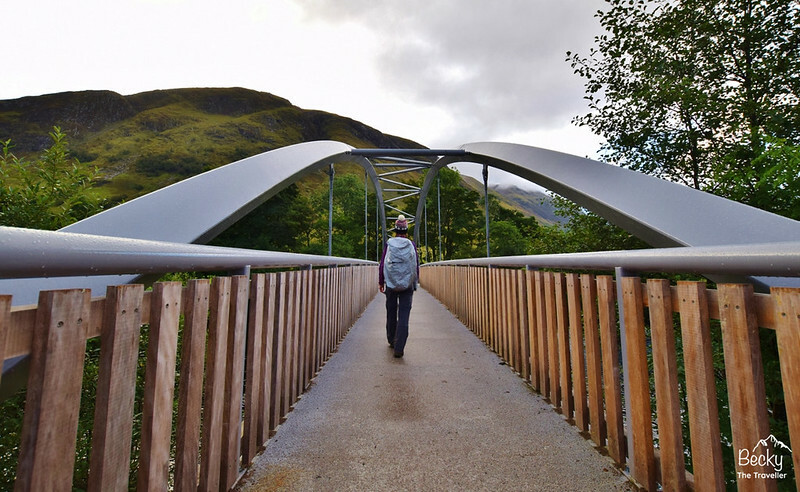 The start of the hike is a bridge next to Glen Nevis Visitor Centre so I decided to pop down and see what information I could gather and find out how long it was going to take me to walk up Ben Nevis! 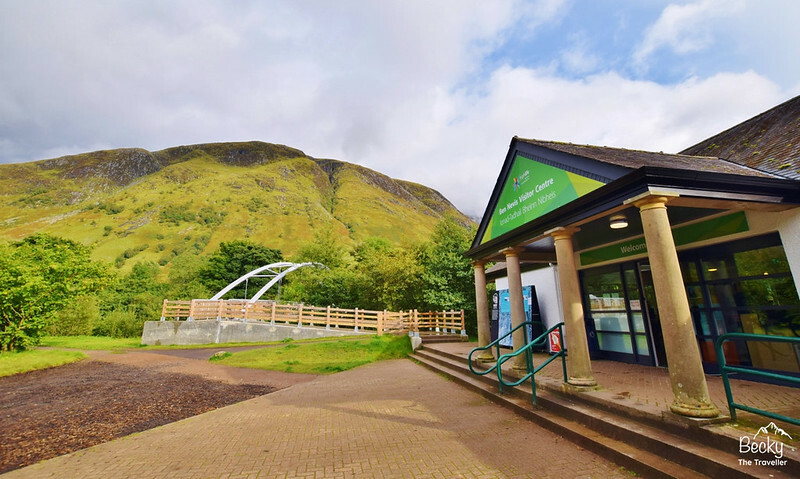 The Visitor Centre is great, there’s lots of information, including Ben Nevis weather predictions, plus a helpful man and map of the Mountain Path route so you can visually see your trail up to the top. The visitor centre is open daily 9.00 – 17.00. I wanted to get an early start on the hike so left Glen Nevis Campsite at 7.45 am. After a few Ben Nevis starting photos I was ready for my hike to climb to the summit around 8 am. Across the bridge you turn right, then next left, following the sign to Ben Nevis (you really can’t go wrong!) The incline starts almost immediately, taking you up a path to a stile. I’m only mentioning this as it might affect what you decide to wear. Hiking uphill is hard work (and hot) so don’t have all your layers on as you’ll be stopping after 5 minutes to take it all off! You now hike up a stone path. And looking down to the right you can see Glen Nevis Campsite, lots of tiny tents dotted about! The path is easy to follow (although I can imagine in snow it would be quite different). You reach another bridge after about 30 minutes. I stopped here for about 20 minutes to take a few photos haha! Even though the route is relatively straightforward I loved having my map with me on the walk. It was great to identify where I was on the walk and calculate how long it was taking me. Keep following the same path, it takes you up via a switchback route, until it seems to completely flatten out for a small section. Great time to catch your breath but not for long! One of the great things about the hike is due to the path you can regularly see tiny dots in front and behind you. The weather did close in quite a bit so the people in front seemed to disappear quite quickly. But you never felt that far away from people. The hardest section to navigate was coming up. Although I was feeling confident that I’d not gone the wrong way so far I decided it wouldn’t hurt to have a few people in front and behind me for this part. There’s a very obvious stone shelter before you go into the cairn section. A cairn is a pile of stones (see photo below), used as a way marker, some are small piles and other are huge rocks. I stopped to take a compass bearing to make sure I walked in the right direction. And this is worth doing as in bad weather and without the sight of the next cairn in front of you, it would be easy to get lost. This section takes about 20 minutes to the top of Ben Nevis. 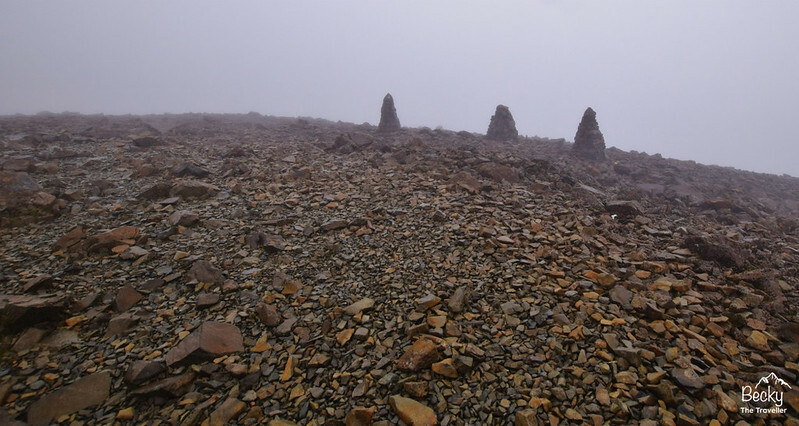 And for me the weather was really closing in, thick clouds were clinging to the mountain, but I still had enough viability to use the cairns as markers, along with my compass. Check the weather report (www.mountain-forecast.com) before you do the climb! Unbelievably the summit appeared from no-where, there seems to be a lot going on, various cairns, stone ruins and a survival shelter. I went inside the survival shelter and could not believe how disgusting it was, apparently, people are capable of carrying bottles of beer to the summit but unable to take the rubbish home! On average it takes 2-5 hours hiking to reach the summit. I had done it in 3 hours so I was feeling pretty pleased. Ben Nevis summit with storm shelter behind me! The information at the Visitor Centre was correct about the weather is 9 degrees colder at the top. And the wind seemed to have appeared from nowhere and made it a challenge climbing to the very highest point! I had planned to use my tripod for a summit selfie photo but there’s no way it would have stood up in the strong wind. So instead I asked a fellow hiker to capture the photo for me. After a good 30 minutes at the top. This was far too long because I was messing around taking photos and my hands were frozen. I have terrible circulation in my hands so they seem to turn to ice blocks within about 10 minutes! Navigating back through the cairns was relatively easy on the way back, plus there was now a steady flow of people hiking to the summit. Most people were asking how much further to the summit so it was nice to give let them know it was only 10 or 15 more minutes. 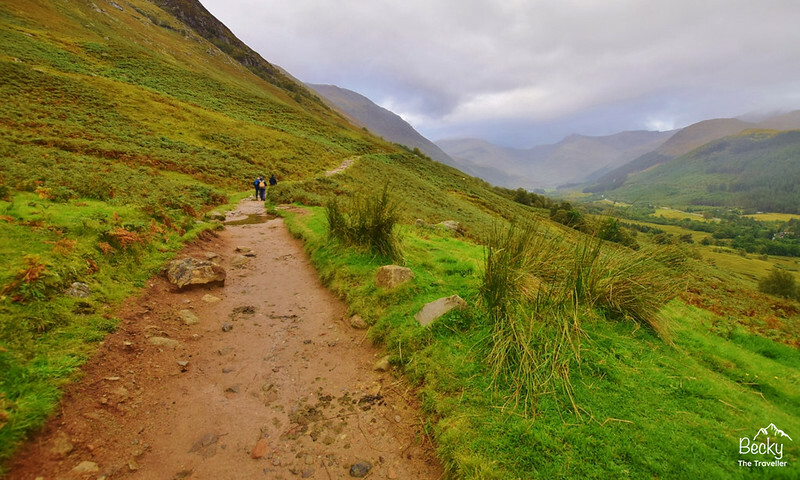 When planning your hike you might be wondering how long it takes to walk up and down Ben Nevis. Generally, going down a mountain is quicker than going up. The average time for descending Ben Nevis is between 1.5-2.5 hours I think I am the exception as the weather cleared on the way down so I stopped to take a lot of photos! I eventually reached the Visitor Centre at about 1.45 pm, nearly as long as the walk up. *Please note hiking times vary according to personal fitness, plus how many times you stop to take photos haha! 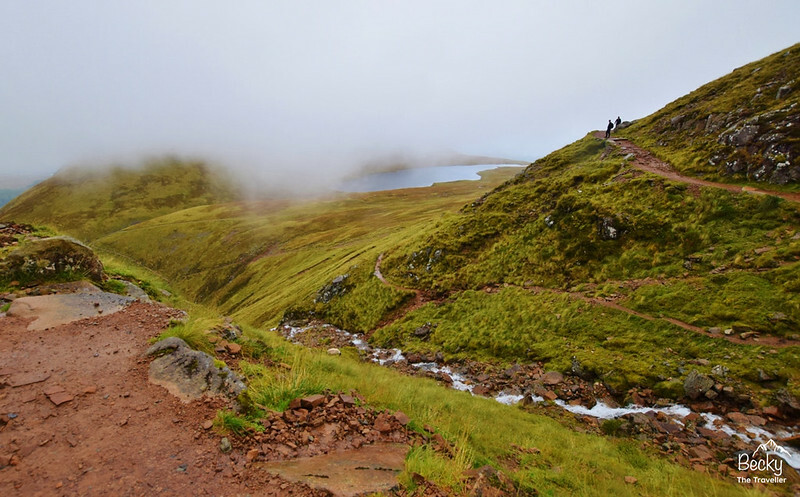 Read next: Why is the West Highland Way an amazing trail (plus tips)? What to wear for hiking Ben Nevis? You may read that you can climb Ben Nevis in trainers or shorts and a t-shirt. In perfect, summer conditions maybe you could BUT that’s not what I will recommend. The best clothes to wear for your Ben Nevis hike are thin layers that are also waterproof/or quick dry! 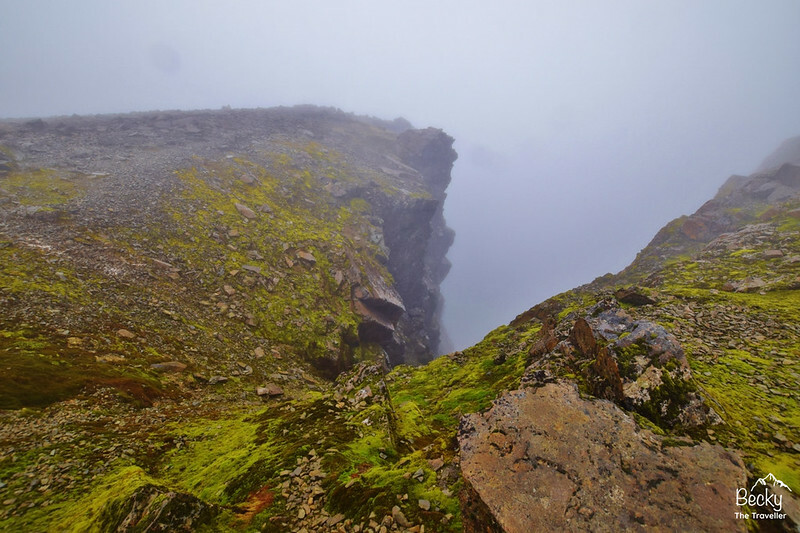 The temperature can be up to 9 degrees colder at the top and on a windy day, this can feel even colder. A fleece to keep your core body temperature lovely and warm. Walking trousers are ideal, plus they normally have good pockets to keep sweets and other useful things in! Don’t wear jeans, they are rubbish for hiking and even worse if they get wet. Take waterproof trousers and a waterproof jacket. Even if it’s not forecast to rain in Fort William you don’t know what the weather will do on the mountain. Plus if it’s cold then you have an extra layer to wear. Look after your hands, feet, face and head! These are the parts then will feel the cold first. Don’t forget a lovely warm hat, gloves, some thick socks. Plus a buff is great for keeping your nose warm. And lastly, don’t forget those walking boots! What other gear and Equipment do you need? A decent rucksack to carry your supplies in (plus a waterproof cover). A camera to capture that summit selfie! When is the best time to climb Ben Nevis? I climbed Ben Nevis in September, a great month to choose to climb the mountain. It wasn’t too busy (I hiked on a weekday, not a weekend) and the weather was pretty good and not too cold! Ben Nevis, although not as high as the mountains in the Himalayas does get snow on the top during the winter months. So factor this in when planning your trip. Spring, summer and autumn months are the best times to climb Ben Nevis as long as you are fully prepared for the weather conditions. 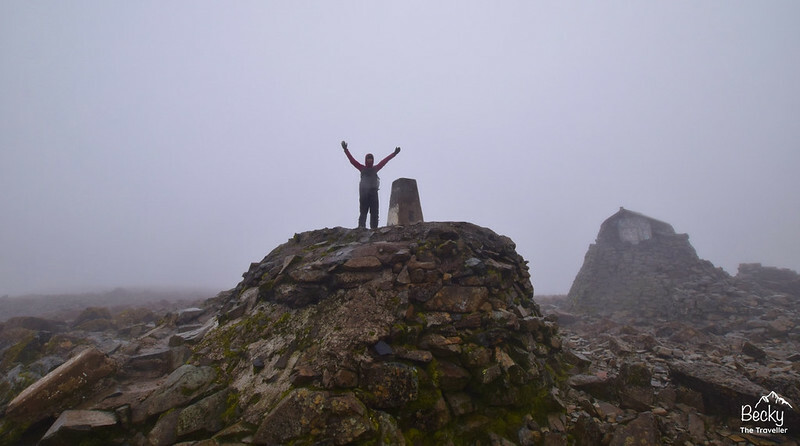 What training do you need to do to climb Ben Nevis? Ben Nevis isn’s a technical climb if you opt for the Mountain Path (or Tourist Track) as I have recommended above for your solo hike. But the more training and preparation you do before the hike the more you will enjoy it! Many people climb Ben Nevis as part of the National Three Peaks Challenge, an epic long-distance challenge in the UK, to raise money for charity. You will need good stamina for hiking over several hours. The best training that you can do before the climb is any walking or aerobic activity – so cycling, running and hiking is all great. But be sure to include some hill training within your schedule as the first half of your Ben Nevis climb is pretty much ALL uphill! Be prepared for the hike with the right clothes and equipment. Do not wear trainers. 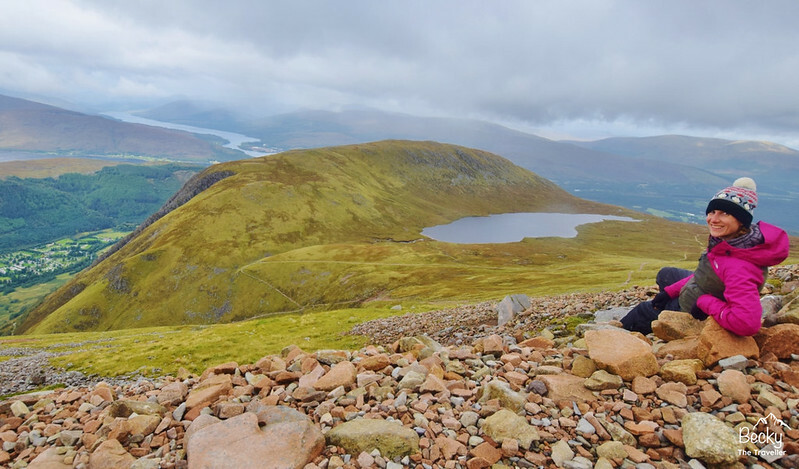 Where to stay if you are hiking Ben Nevis? The start of the Mountain Path route is located in the town of Fort William. And you’ll find plenty of options for places to stay. 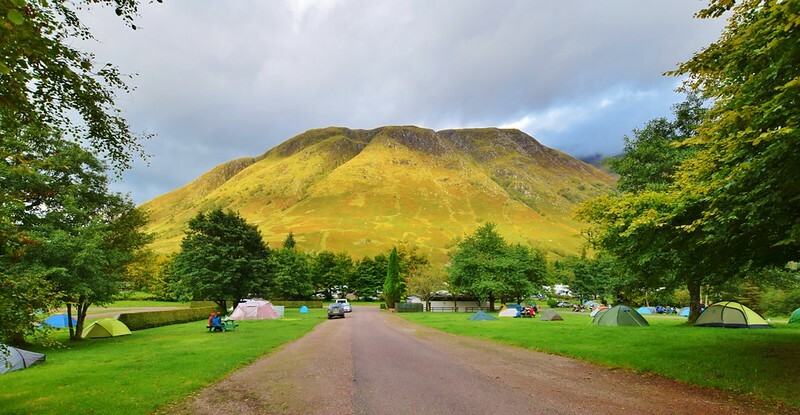 But be sure to book in advance, Ben Nevis walk is popular destinations for people doing road trips in Scotland so places can book up (especially in peak season). This is 0.5 miles from the start, about a 10-minute walk. Perfect for on the way back when you want to take your boots off! Are you planning your Ben Nevis walk and wondering how long it will take? Are you hiking solo or do you want to know about the route? Ask me any questions in the comments or send me a message on Facebook. You might remember me from Instagram (we were talking about spider phobias hehe). Thought I would check out your website (which is fantastic)! This is a great post. I’d love to hike Ben Nevis one day. When I was there we arrived late in the day so it was a bit of an inappropriate time to start the hike! Your photos look great and the tips will definitely be handy if I ever make it back there. Thanks so much for your comment, yes I remember the spider conversation haha! Hopefully, you’ll get to do again, it’s a great hike. I still haven’t been to Scotland, how is it we forget to travel to the places on our doorstep?! But adding Ben Nevis to the bucket list! Oh honey, you’re so adventurous!! <3 That view was SO worth it, I'd love to undertake that hike myself! 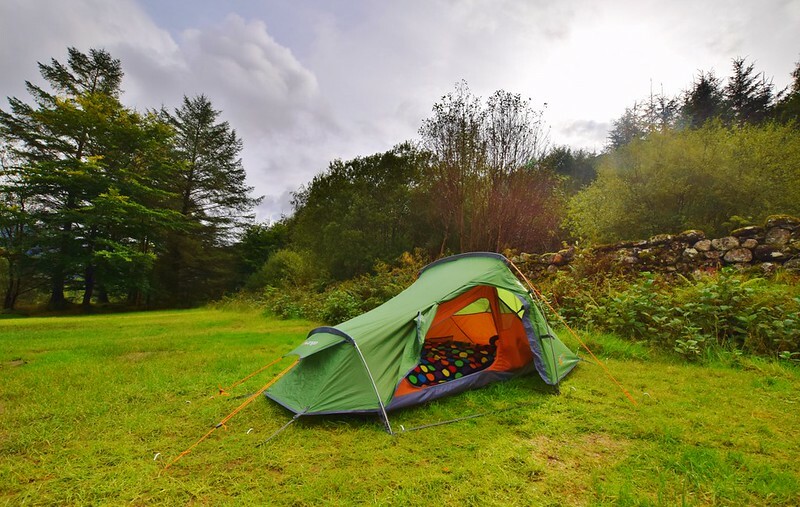 And great tips for solo hikers, thank you for the lovely post!! Thanks Eniko, I think that’s a good decision. It’s a beautiful hike but I can imagine in bad weather it wouldn’t be much fun! Great info! I’d love to do this peak. I thought about doing it after the West Highland Way but I was too tired! Your pictures should be used in an ad campaign. What gorgeous scenery! Need to get here.